This exhibition features selected photo works from different series, combined and presented as duos and trios. The photographs were taken some time ago, between 1989 and 1997 in Hong Kong. Hollian Thesaurus was a significant work done between 1994 and 2000. The series has more than ten works and is a contemplation on Art, Politics, Religion and Power. From this series, the pair Jinx and Bauhinia are especially memorable, touching on the period of historical change in Hong Kong: the pre-and-post 1997, when Hong Kong was critically searching for it's identity. On a personal level, I was looking for self identity too. This resulted in a number of photographs featuring family members, mixing new and old elements appearing in layers. I took black and white portraits of my mother and aunt in the studio when they were in their late forties. Using negative images, I created the duo-picture series, Duo: Aunt, Mother, Lolly and Me. In it there are also photos of me and my cousin Lolly, taken by a studio in the 1950’s, and pictures taken at home in the 1970’s. Another layer of the photo is a crayon doodle of my daughter, Iris, when she was a few years old. Several generations thus come together, in an overlapping sort of way. Lady with glossy lips and red nail-polish is a work regenerated from an old studio portrait of my mother. Just recently I have relocated my Aunt's beautiful portrait too and I am able to create Lady in black cheongsam with flower pattern. Aunt died a few years before my mother. Now the two sisters are united, side by side. I think photos like these have gone far beyond the domain and original definition of portraits. For Cameraworks, Holly & Wingo, I used materials from our old exhibition catalogue (1981) to recreate a new work. It is a constructed photogram on Cibachrome paper. The many processes involved spring from my belief that photography should be adventurous and fun. With this idea in mind, I can become free, and even mischievous to fabricate the later photograph We knew each other since tender age. Footsteps of June was an outgrowth from The Golden Lotus, which was an experimental dance/theatre piece (1989) conceived by Sunny Pang. Teamed up with Norman Fung, Sunny founded the interdisciplinary group Many Levels in Performance in 1987. As an added visual component to the play The Golden Lotus, I was invited to present an exhibition, creating a new project on portraits of the musicians and dancers. The portrait of musician Peter Suart was particularly unsettling since it speaks directly to the 89 Democracy Movement at Tiananmen Square. The black leather jacket he wore for the shooting session was bought during the students movement in that very Spring in Beijing. 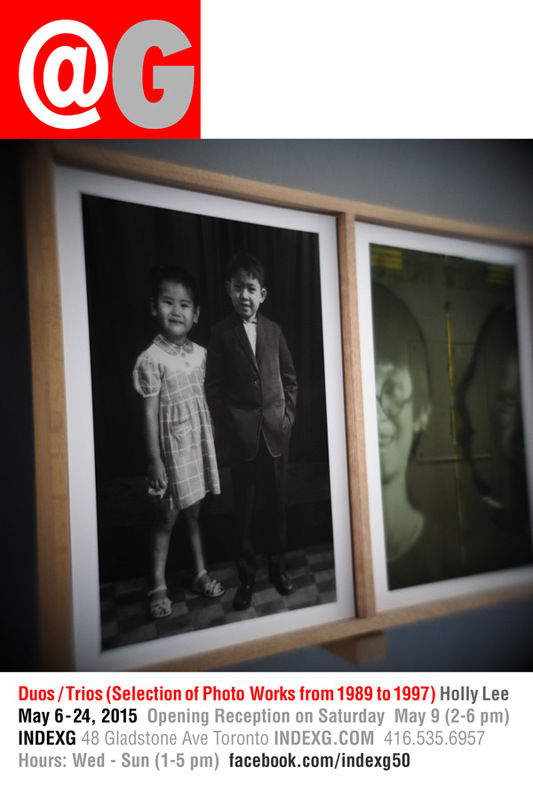 Photograms in Triptych was produced for the exhibition Pin-Pun, exhibited along with photo works by three other photographers. At that time I experimented a lot in the darkroom with photograms. If one's work is truly honest, it reveals who we are, where, when and how we live. At the time of producing these photograms I did not have any intention to point to our polluted world. The images were simply made of wasted stuffs.